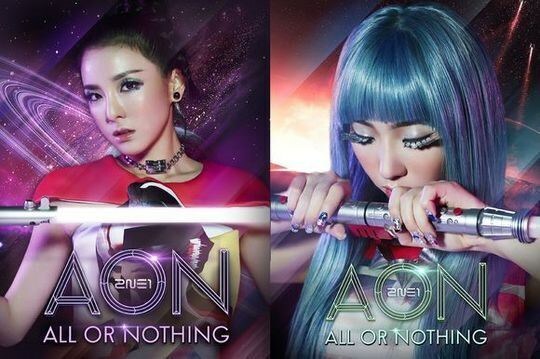 [OSEN=Kim Sara] The teaser image of a girl group 2NE1’s 2nd world tour ‘AON- ALL OR NOTHING’ is revealed and is drawing the attention. On YG official blog on the midnight of January 17th, the world tour teaser images of 2NE1 members Minzy and Dara were posted. In the revealed picture, Dara is grabbing the attention with fancy make-up and bold accessories with outer space as the background. It gives a look into Dara’s another transformation as it gives off fantasy vibe. Minzy also made a unique pose with outer space as the background and is getting the attention. Minzy grabbed the attention with fancy eye make-up and fashionable nail art. She especially showed off different kind of charm with long emerald-colored hair. 2NE1 have a case of receiving hot interests as the world tour and their title of the new album ‘2NE1 AON’ is revealed on January 15th and with revealing of the teasers for each of the members, 2NE1 aroused more curiosity. There is also hot interest toward Bom and CL’s teaser image, which is not yet revealed. The fans who saw the teaser image said ‘2NE1, this concept really is the bomb’, ‘The vibe of Minzy and Dara is cool’ and ‘I look forward to Bom and CL’s teaser image’ and so on and showed joyful anticipation. Meanwhile, 2NE1’s 2nd world tour is expected to take place in 9 countries of Korea, Japan and China and so on and in 13 cities of Seoul, Hong Kong, Singapore and Yokohama and so on with 17 sets of performances. Starting from March 1st and March 2nd, they will start off their world tour with the performance in Seoul in SK Handball Stadium in Olympics Park located in Bangee-dong, Songpa-gu in Seoul.